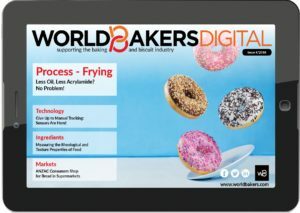 iba sets the stage for the baking industry’s most important displays of innovation in all areas. Here are highlights of we will be able to see at the exhibitor stands. iba is a highly-anticipated event for the entire industry, from the organizers to exhibitors, competitors and global visitors, as it sets the stage for all the latest breakthroughs every three years, in all categories of solutions pertaining to bakery and confectionery. Other Baker Perkins upgrades making their first appearance at IBA focus on making bread and biscuit production smoother through improvements to the hygienic design that make maintenance and cleaning simpler and quicker. The company’s wide range of steel belts for different applications in the food industry will be displayed, as well as its capabilities related to on-site service/repairs, complementary products like belt tracking systems and conveyors. A new cleaning device for steel belts will be introduced. “[We will present] our wide range of steel belts for different applications in the food industry, our capabilities related to on-site service/repairs, complementary products like belt tracking systems and conveyors as well as a new cleaning device for steel belts,” Brokke said. Corresponding with the Bühler-Haas merger, the focus at the stand will on highlighting its benefits for the industry. “Not only can we offer now single machines, but the complete process chain from grain to wafers, biscuits or many other baked products. Components of such lines will be displayed physically and other solutions along the value chain will be presented as augmented reality,” Bühler tells us. A second focus is on energy efficiency and sustainability. Innovations such as the continuous mixing technology ContiMix™ or the ECO-Oven will present the latest developments from both companies. Along with the complete BakeWATCH products portfolio, the company is introducing the next rev of its kill step automation software, called BakeWATCH Kill Step Calculator. It now includes the ability for users to add specific product varieties and D-Reduction constants for kill step validation reporting beyond what AIB International publishes. DEBAG will unveil a global innovation – the e.CLEAN 500, the first fully automated oven cleaning system with a 500-day refill cycle. Once the oven has been filled with a cleaning agent, the supply lasts for up to 500 days. This is taken care of as part of DEBAG’s customer service. e.CLEAN 500 is suitable for use with DEBAG’s DILA and DECON in-store baking ovens. The new DEDEC deck oven and the intelligent One-Touch Control will also be among highlights. The Dough Experts offer special crops for all types of sourdough fermentations. The company’s pre-dough plants solutions will be presented, along with the DIOSNA A100 Ecoline, an aroma system for individual production by soaking, brewing, cooking and AromaStück®. DIOSNA AF100 Compact Rye- and Wheatfermenter will also be at the booth, as well as DIOSNA Breadmixer BM500 for 375 kg of bread mix, and the company’s dough kneading solutions. display; they will meet trends for shorter lists of ingredients, demand for organic and healthier products, convenience, consumers’ amazing experience. Solutions for the extension of organic improver ranges, clean label premixes for long shelf-life bread, reduced-fat or sugar solutions for baked goods will also be presented. System solutions for dividing, forming and depositing dough will be demonstrated. For example, naan bread can be produced in top quality with the Handtmann SE 442 cutting unit. The SE 442 divides dough in combination with a VF 800 dough divider. Another highlight of the trade fair is a VF 800 dough divider in combination with the SE 443 cutting unit for making tin loaves. It is perfect for bread types such as wholemeal bread (rye, wheat, spelt), rye bread, mixed rye bread, multi-grain bread and gluten-free tin loaves with high dough yield. Five solutions will be highlighted: Limagrain Céréales Ingrédients and Unicorn Grain Specialties join forces to offer a wider offer for clean label bakery; CERECLEAN, a new clean label preservative for bakery products; a new range of organic bread improvers in the Bricks offer; toasted buckwheat, the natural benefits of the Kasha; and BRICKS, the bread improvers customized for all your bakery products. The new technologies MECATHERM is launching at iba will be the highlights at the stand, starting with the new oven (M-TA oven), the new conveying system (M-UB handling system), and the new dough divider (M-NS divider). The M-TA oven was designed with complete versatility in mind, and industrial trends for 100% productivity, meaning no product loss and reduced cost of operation. It has a modular construction, built in independent compact modules. Each module comes with its own, independent types of heat transfer options. Airflow circuits giving an extremely homogenous flow throughout the oven’s width ensure the oven’s precision. In addition, it adapts to the number of products inside and allows quick changes from one product to the next, while consuming less energy. MECATHERM is also launching a new modular handling system, the M-UB handling system, that ensures products are delicately handled. Its trays are on a continuous loop, which means a homogenous transport in every process step. No shocks affect the product, so there is no danger that it could collapse, and there is no friction, which ensures food safety through no risk of contamination. In addition, the new M-NS divider is a high-precision machine (+/- 2% standard deviation), with a product range starting at 250g, and capacity of up to 4,000 baguettes/hour. Its main advantages are benefits in product quality, especially authenticity, the specialist told us, with the added value of a low cost of ownership. The machine’s working principle comprises the stages: generating a calibrated piece of dough, dough sheet formation, cutting the dough, and final calibration. MULTIVAC will be presenting a complete range of solutions for packing bread, bakery products, biscuits, and snacks. In addition to two chamber machines, the exhibits will also include a compact thermoforming packaging machine and a tray sealer. Various compact machine models for producing MAP packs will be shown at the trade fair, including the R 085 e-concept thermoforming packaging machine. RADEMAKER introduces a wide range of completely new generation production machines: high-end industrial breadline, midrange/medium capacity breadline, high-end industrial pastry line, midrange/medium capacity pastry and croissant line; concept midrange sheeting line; advanced new croissant molding systems; and several depositing machines. SASA is introducing iNFiNiUM® 6001, the new generation of silicone-based non-stick coating. “The iNFiNiUM® 6001 can not only be successfully used at all times to supersede the previous iNFiNiUM® 601, but it can also now be considered as a better option when PTFE or PFA non-stick coatings were used, thanks to its newly extended characteristics,” Pierre Escarbelt, sales and marketing director, Groupe Sasa Demarle, tells us. The new silicone coating solution is as versatile as the previous iNFiNiUM® 601, with great results for baking crusty bread, on all automatic lines, whether equipped with an upfront heat booster or not. SASA has developed the new generation of silicone with greatly improved characteristics, whether on abrasion or on temperatures, for reducing the CAPEX and OPEX of the industrial bakers. The iNFiNiUM® 6001 can withstand more than 5,000 baking cycles, up from 3,500 with the previous solution. It can also withstand operating temperature up to 260°C, easily competing with other type of non-stick coating chemical formula (e.g. PTFE or PFA), whereas the iNFiNiUM® 601 was limited to 240°C. For an improved thermal performance, the color of the new coating is now charcoal grey, darker than the previously used light grey. The cloud solution, svebaconnect, part of middlebyconnect, is among highlights for Sveba Dahlen. The company will present a new S-Series combination oven, a new Prover F-Series (the F500 will be shown), and the updated rack oven C252 (new design) and also with core temperature. 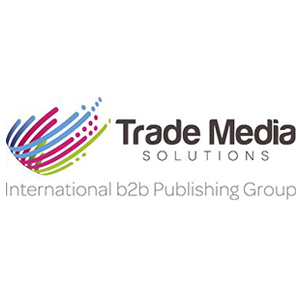 Innovations from the group’s three brands will be represented: Tromp Sheeting & Depositing Systems, Den Boer Baking Systems, and VanderPol Waffle Systems. Among highlights will be the “All about Pizza” concept, to achieve the optimal pizza production with Tromp integrated process line, designed with modular euquipment. The booth will also display a section from a Multibake HT tunnel oven, a directly heated oven with a stone floor for perfect pizza production. Elements of a sheeting line and a topping line will also be displayed. 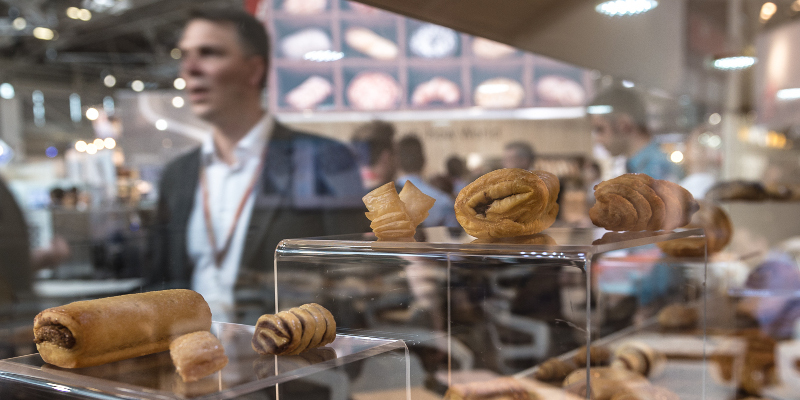 WP BAKERYGROUP presents a variety of innovative ideas at this year’s iba 2018. Among them are: KRONOS DIGITAL, the first intelligent mixer that is able to stop the mixing process at the optimum point in time ; the MATADOR STORE Colour Edition oven; MULTIMATIC; ROTOTHERM Green heavy duty, for rack trolleys of up to 1,560 mm; WP NAVIGO 3 – the new control system generation with optimized user interface; MAMMOETH, the world’s first fully servo-controlled dough divider; VACUSPEED INDUSTRIAL: fully automatic combination of baking in deck ovens and immediate vacuum conditioning; THERMAL OIL TUNNEL OVEN, a new development combining constant radiant heat with true convective turbulence, and more.